I had to waste time today while getting the oil changed in my car so I wandered to the mall and into a huge sale at Williams-Sonoma. 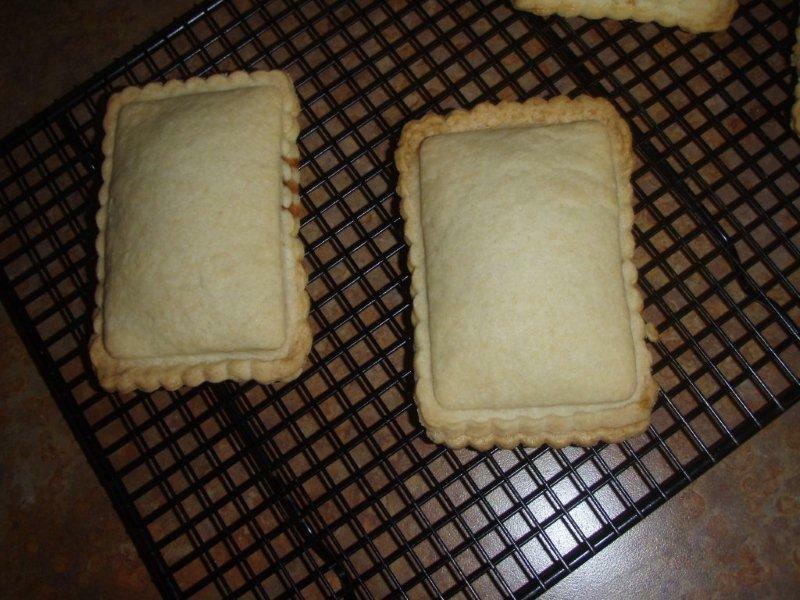 I found a toaster pastry press, and here are the results, fresh strawberry and Nutella toaster pastries. In a food processor, pulse the flour, salt and sugar until combined. About 5 pulses. Add butter and process until the mixture resembles coarse mea, about 10 pulses. Add 6 Tbls of the water and pulse 2 or 3 times. The dough souuld hold together when squeezed with your fingers but should not be sticky. If it is crumbly, add more water 1 tsp at a time, pulsing twice after each addition. Turn the dough out onto a work surface, divide in half, wrap and refrigerate for 2 hours. Roll dough 1/8 inch thick and cut into shape using outside ring. 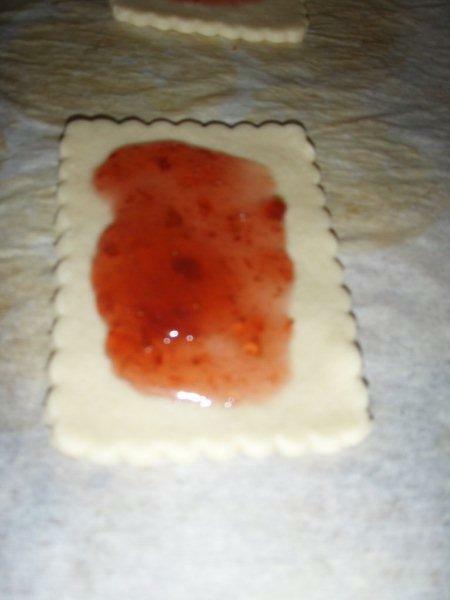 Place on parchment lined cookie sheet and place 1 Tbls jam or filling in center of dough. Rub egg was around edges. Roll out remaining dough and place one piece on top of each pastry. Using inner ring seal pastries. Refrigerate 1/2 hour, bake in preheated 350 degree oven. Bake about 25 minutes until golden brown. Top with icing of your choice. Thank you Jodie and Matt, repeat A Chef of Your Own clients I have been cooking for the last three weeks. They had a request for dessert tonight and it was a raving success. They asked for Sticky Toffee Pudding and I found this one at www.foodnetwork.com. They said it was one of the best they had. It was YUMMY!! Preheat oven to 350 degrees. Butter a 10-inch round or square baking dish. Sift the flour and baking powder onto a sheet of waxed paper. Chop the dates fine. Place in a small bowl and add the boiling water and baking soda; set aside. In a bowl of electric mixer beat the butter and sugar until light and fluffy. Add the egg and vanilla; beat until blended. Gradually beat in the flour mixture. Add the date mixture to the batter and fold until blended with a rubber spatula. Pour into the prepared baking dish. Bake until pudding is set and firm on top, about 35 minutes. Remove from oven to a wire rack. Toffee Sauce: Combine the butter, heavy cream and brown sugar in a small heavy saucepan; heat to boiling, stirring constantly. Boil gently over medium low heat until mixture is thickened, about 8 minutes. Preheat broiler. Spoon about 1/3 cup of the sauce over the pudding. Spread evenly on top. Place pudding under the broiler until the topping is bubbly, about 1 minute. Serve immediately spooned into dessert bowls. Drizzle with toffee sauce and top with a spoonful of whipped cream. Another great shrimp demo at The Fresh Market this Saturday in Altamont Springs from 3-6. I will be grilling up shrimp, stop by to get a cooking tip or just to say hello. curried yogurt sauce for dipping. A Chef of Your Own clients requested Bruschetta tonight to go with Lasagna so I found this recipe on Simply Recipes.com. Great site to find recipes. Here is a treat for breakfast from A Chef of Your Own. These muffins are stuffed full of sausage and cheese so they make a hearty start to the day. Combine flour, cornmeal, bs, salt and cayenne in a bowl. until moist. Gently fold in sausage and cheese. Here is A Chef of Your Own dinner recipe I have made for both vacationing and regular chef clients. These can be personalized by using crumbled tofu or ground beef in place of the ground turkey, or making a red sauce to go over them. I hope you enjoy them as much as my clients. Bon appetit! lengthwise slit in each chile, discard seeds, leaving stems intact. medium heat. Add turkey and cook until browned and crumbles, about 10 minutes. beans. Spoon about 1/3 cup mixture into each chile, fold side over filling. Arrange in an 8 inch square baking dish coated with cooking spray, set aside. cayenne, cumin and stir with a whisk. Cook 30 seconds, stirring constantly. over milk mixture. Bake at 350 degrees for 20 minutes or until sauce is bubbly. Happy Independence Day! Here is a dessert that has been very popular with my A Chef of Your Own clients updated for this holiday. Combine brown sugar, flour and cinnamon and toss with berries. Drizzle lemon juice over berries and pour into baking dish. Combine flour, nutmeg and sugars. Cut in butter until mixture resembles coarse meal. Stir in oats and chopped nuts. Sprinkle over berries and bake 25-30 minutes in a 375 degree oven. Serve with vanilla ice cream.